For the past several months, S&T Bank and the Penguins have been running the Name that Lange contest in search of a new catchphrase for Penguins Hall of Fame broadcaster Mike Lange. You know, the “Scratch my back with a hacksaw” and “He smoked him like a bad cigar!” goal-scoring quips. Well, a winner was picked Tuesday, and the team tweeted out the winning phrase. 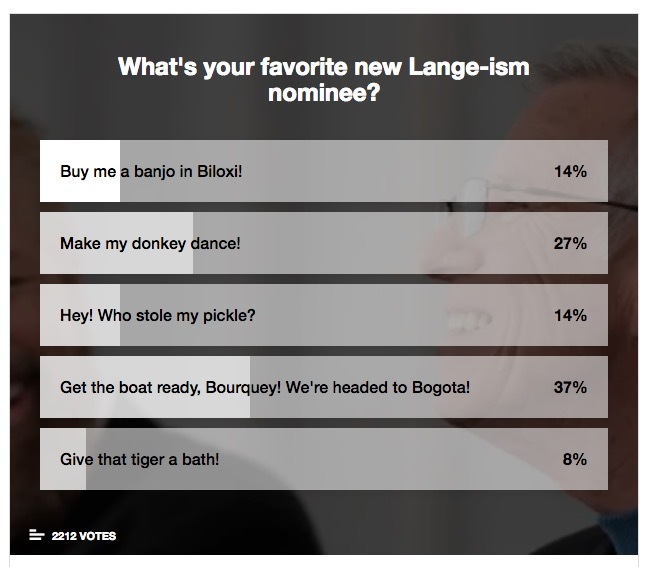 “Buy me a banjo in Biloxi” will now be in Lange’s vast arsenal. The winning phrase was submitted by local Pens fan Bruce Rarig. And it sounds even more beautiful when said in response to a great goal. This is only the second time in the history of Mike’s career that he has adopted a phrase created by a fan. S&T Bank posted a video of the winner receiving hearing the honor for the first time. Out of more than 1,500 entries, five finalists were released last week. The Trib polled its readers, and “Get the boat ready, Bourquey! We’re headed to Bogota!” was the overwhelming favorite.